*Offer valid through Dec. 25, 2018. Promotional card delivered Jan. 3 and valid through Jan. 31, 2019. Limit one per customer. No time to come inside? From December 3-24, Curbside Pickup will be available starting at 8am. *To qualify for this offer, eGift Cards must be purchased between December 22, 2018, at 12:01am Pacific and December 25, 2018, at 11:59pm Pacific ("Promotion Period"). This offer is non-transferable and may only be used by the intended recipient. The promotional card will be sent on January 3, 2019, to the purchaser's email address provided at the time of qualifying purchase. This offer applies only to electronic gift card purchases from Nordstrom.com during the Promotion Period. Minimum purchase of $150 USD is required to receive a $20 USD promotional card; minimum purchase of $300 USD is required to receive a $50 USD promotional card. 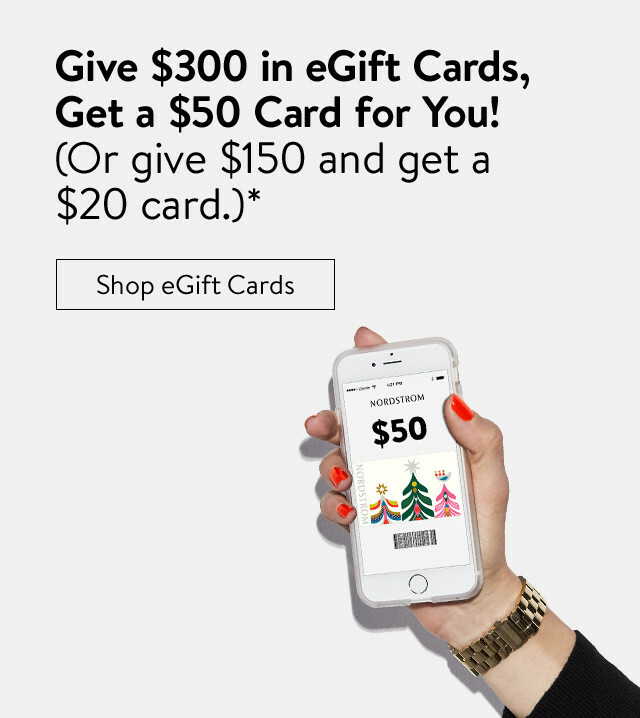 Purchases of electronic gift cards from the Nordstrom app are not eligible for this offer. Limit one promotional card per customer. Limit of one promotional card per transaction. Promotional card cannot be reloaded, redeemed for cash (except as required by law) or applied as payment to any account. Promotional card is not valid for purchases of Gift Cards or previously purchased items. If item purchased with promotional card is returned, promotional card value will be deducted from amounts refunded to original tender. Promotional card may not be purchased, sold, traded or transferred. Promotional card will be valid in Nordstrom and Nordstrom Rack stores and online at Nordstrom.com, Nordstromrack.com and HauteLook.com and EXPIRES AT 11:59PM EASTERN ON JANUARY 31, 2019. Void where prohibited. FREE SHIPPING. FREE RETURNS. ALL THE TIME. This offer is only available for Standard Shipping on Nordstrom.com and is not available in Nordstrom Rack stores or for international orders. Please visit nordstromrack.com, HauteLook.com or trunkclub.com for details about their shipping and return policies. Add nordstrom@eml.nordstrom.com to your address book to ensure that you receive our emails in your inbox. This is an advertising message from Nordstrom. TO OPT-DOWN OR UNSUBSCRIBE: This email was sent to you because you are a valued Nordstrom customer. To receive fewer updates or remove yourself from our email program, please change your email preferences.